This is a collection of charming Christmas Birds Images! I just love using Bird themed ornaments and decor in my Holiday Decorating… Birds and Trees go hand and hand anyway don’t they? So it makes sense to me to include them on a Christmas Tree. These sweet Vintage Images would be perfect to use in your Holiday Crafts and Decor Projects, including Ornaments, Handmade Cards, Tags and more. 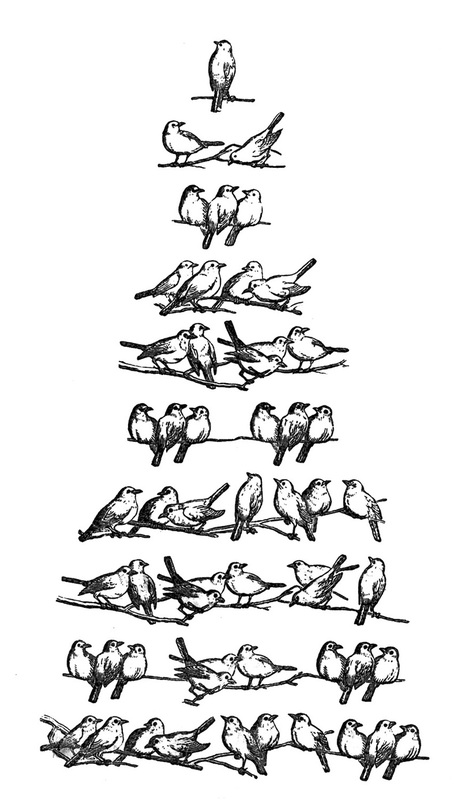 These adorable Christmas Birds images come from an 1870’s Children’s School book! I just thought these little Birds, formed into a Tree shape, were so much fun!!! Wouldn’t these make a darling Christmas Card?!! I’ve made a few options, including this green one that you see above. These were first added to my blog several years ago, but they have been updated with higher resolution files. 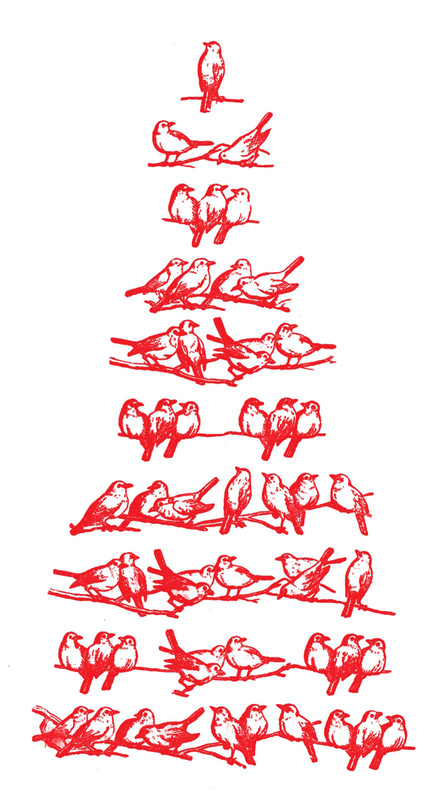 Here we have another version of the same Christmas Clip Art Birds, but this one is done in bright red! And lastly we have the original black and white version. I think this one would make a great Photoshop brush to use in your Design Projects! 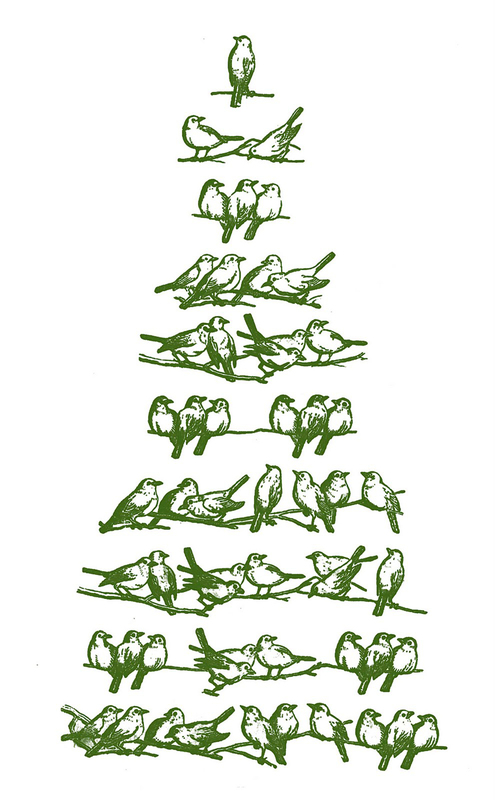 Next we have this Charming Vintage Birds Christmas Tree Image! 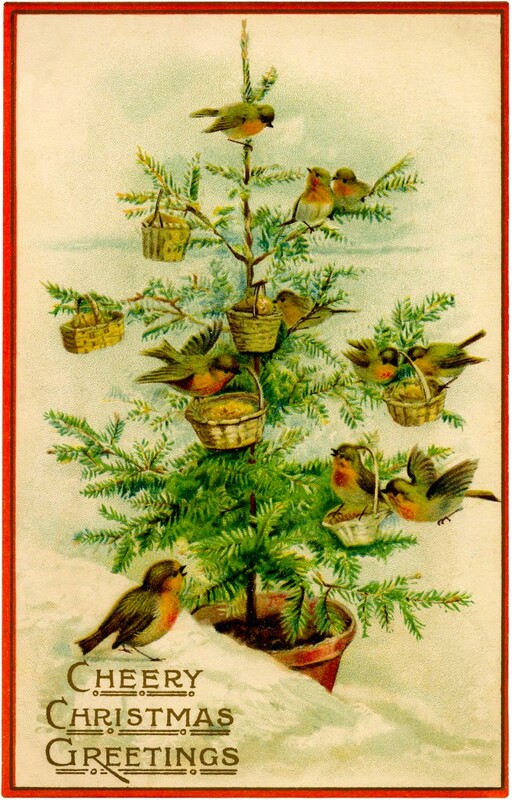 Shown above is a lovely old Christmas Postcard featuring a small Pine Tree that is peppered with small baskets full of Bird Seed. The Birds seem quite happy about their feast! A nice graphic for your Holiday Projects! Next we have this Nostalgic Little Birds with Christmas Calendar Postcard! Three colorful tiny birds in a snow covered pine tree with pine cones look at a calendar on a wooden pole. One of the birds is lifting the date page to reveal December 25th. 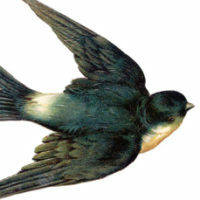 The birds have coloring of browns with pastel yellows, blues, and greens. The background is a lovely shade of blue with a jagged golden frame. Gold letters proclaim A Merry Christmas. 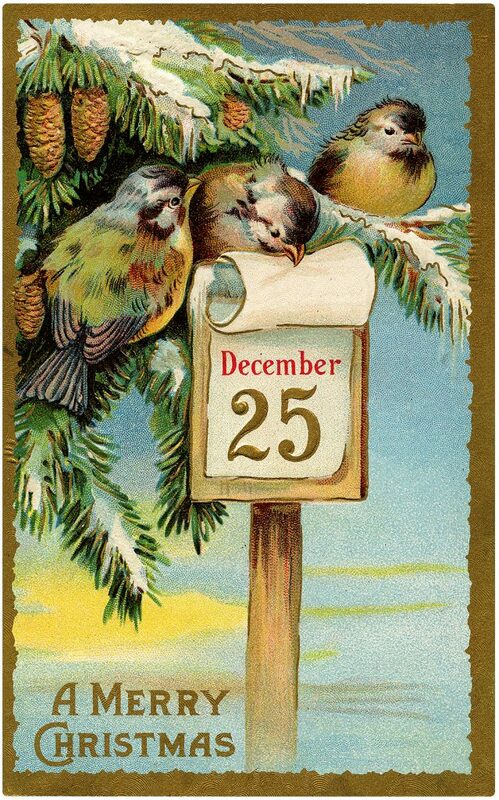 Our next offering is this charming Antique Christmas Birds Picture Image! 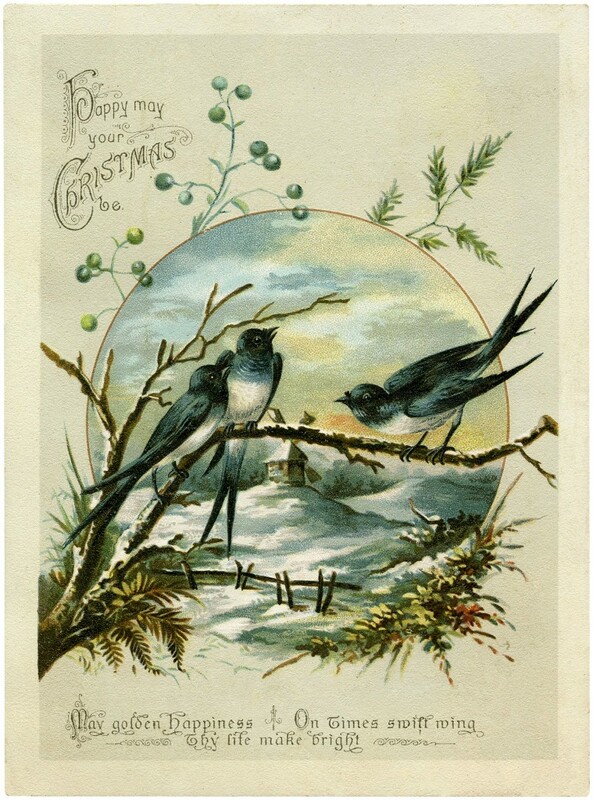 Shown above is a fabulous old Christmas Card featuring 3 lovely Swallows, framed by a Snowy Scene. Isn’t this just so pretty?! At the top of the card is a Christmas Greeting, in the most beautiful ornate font. 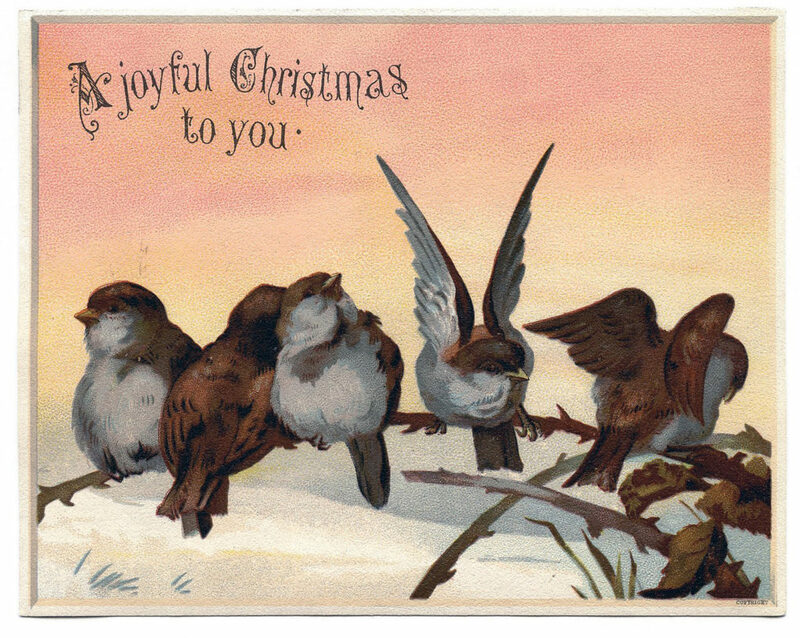 The sentiment reads “Happy May your Christmas be … May Golden Happiness on times Swift Wing, they Life make Bright”. And here we have this pretty little Victorian Christmas card! Here we have 5 sweet little brown and gray birds, perched on a snowy branch, in this charming Winter scene. I think this image would make a nice gift tag! The sentiment reads “A Joyful Christmas to you”. I hope you enjoyed this very sweet collection of Pictures of Christmas Birds. You might also like our Best Christmas Images Collection HERE. « DIY Vintage Madonna and Child Art Triptych – FREE Printable! I had a knit fabric with something very similar to this print… I loved it to to threads! Oh this is wonderful! Thanks so much for sharing. I have to agree with all the comments. Excellent. Thank you! I just LOVE this too! Can’t decide which version I like best! Will try making a card – or wouldn’t it be great for a tag? Oh this is so beautiful! Thank you very much! Absolutely my favorite so far. A-freaking-mazing. Thanks so, so much! Fascinating! Thanks for the image! Love it!!! Thanks for sharing. Wonderful! Wonderful! I can think of many ways to use this delightful graphic. Thank you. Yay!! I’m so glad you guys liked this one so much, I love it too!! These are SO sweet. Thank You, Karen! Love this too……trying to think of something witty to say for a card…….as always thanks for sharing!!! Great image, thank you for sharing. Thank you! I’m thinking about Christmas cards too. I can envision so many uses for this beautiful image!! Adorable! Perfect to adhere to a gift bag! Thank you!! So very sweet!!! Thanks so much for sharing. What a beautiful graphic. I think the black tree could be used for times other than Xmas. I too love this image! Thanks so much! Another “thumbs up” vote. I enjoy all your images (and thank you wholeheartedly for finding them and sharing them with us), but this one really jumped out at me. I love these! I saw this image on Pinterest and was hoping that it was large and framable. I don’t know why, but I’m almost in tears over finding these images (happy tears!). I clicked on a pin, which led me to a post with several graphics on it. I had to scroll down to find the one I was looking for (which wasn’t this one, btw), and saw this one. My heart did a little flip! I wanted to make sure I could download it (legally and ethically), so I started clicking until I finally landed at the original spot! And then find out that it’s vintage AND free? Be still my heart… 😉 Thank you so much! Thank you soo much for these images! They are soo cute! I was wondering if you could make one in blue and one in brown? Thanks soo much! Sometimes I use your pictures in my cards (thanks a lot for inspiration! ), but this bird tree… they all like it very much!!! I’m sure the book told of how it is a counting aid, from one to ten. Am planning on printing this as a coloring page for my grandbabies when they are old enough :~D Thanks! A stunning image. These are awesome! I love the one especially with the birds feasting on the bird seed in the baskets. Even they are having a joyous time of eating. And the different old style of fonts they use on some of these images give you that warm, cozy feeling. Thank you for sharing all of these beautiful images!